Summer conjures to mind many things - heat, dryness, sun. Did you know that all of these things contribute to hair damage? Your hair is a part of your body that, believe it or not, is definitely very affected by the rays of the sun, both the heat it provides and the light source itself. Take some steps to protect your hair this summer from unnecessary hair damage. The sun dries out human hair, causing more split ends and breakages as a result of brittleness. The feel of it will be coarser, and while the sun may lighten your hair to an effect that’s pleasing, the sun can negatively affect dyed hair in particular, changing your chosen shade in a way that may end up brassy, reddish, or orange. 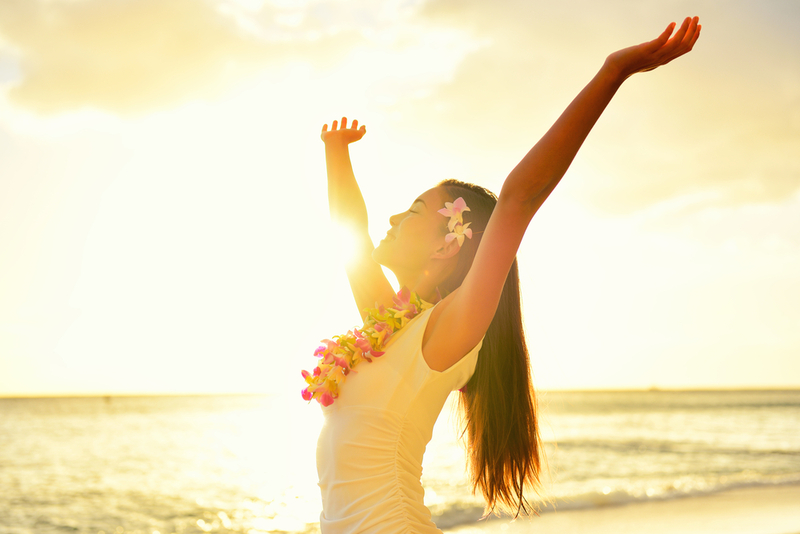 of these tips and you’ll be ready to rock out your summer in the sun! In the summertime, it’s important to lock in moisture. This often means changing your shampooing habits and bulking up on conditioner. Washing your hair daily can strip the hair follicle of natural oils that protect it. Since the sun already dries out your hair, do yourself a favor by not drying it out any further. Get your hair wet and condition it, but leave the ‘poo for later in the week, or try out solid shampoo made of natural ingredients to get out the day’s sweat and dirt without stripping your hair. You should always be wearing sunscreen, even under makeup on cloudy days, but you may not be applying it properly. You should reapply on the hour or after excessive sweating or a dip into a body of water. In addition, you definitely should apply sunscreen to your part, as the scalp is lighter than the rest of your skin and is susceptible to sunburn. There are also sunscreen products marketed exclusively for hair itself. These products protect the hair strands from sun rays and are a great choice if you want to make a hair coloring last longer. After a day outside, despite preparatory efforts your hair still will be dryer and more brittle. To counter the effects of beach days, employ a deep conditioning treatment after spending time in the sun. There are both drugstore and higher-end options for hair masks, or you can try out making one at home out of natural ingredients like avocados and honey. Finally, after every hair washing and styling you should try out essential oils to fight breakages, dryness, and restore smoothness to your mane. Moroccan oil is a great option for this as it can be used to style damp or dry hair. Vitamin E oil can be used on the skin or hair, and the ever -versatile coconut oil can be applied to the hair as well. For a sweet smelling option try lavender or almond oil, and for a super boost, try a hair serum that combines several of these ingredients. With all of these topical preparations, try to keep your hair out of direct sunlight. Whether that’s by sticking to the shade when possible or trying out a snazzy new sunhat, your hair will thank you later. Have you ever wondered how some people can step off a plane after a long journey and still look fresh, as though they’ve wandered out of a spa? This is usually the case when the paparazzi snap the world’s hottest fashionistas. What are their secrets for always looking so stylish and put-together? Read on to discover twelve rules to make your future travels uber chic. Sunglasses are not just a practical investment, keeping the sun’s damaging light off your face, while simultaneously blocking melanoma and melasma. They’re also a sneaky way in which famous fashionistas keep themselves in the style files even with jet-lag. Sunglasses help to cover up tired eyes from public view, so make like Cara Delevingne and Charlize Theron, and wear large ones to look fashionable every time. Of course you want to be comfortable when you travel, but that doesn’t mean you can’t be trendy. Victoria Beckham is the queen of relaxed chic when she travels as she has been spotted wearing all-black outfits, such as black skinny jeans teamed with a blazer and knee-high boots. Black is a neutral that is sure to keep you looking stylish (even if you are comfortable in jeans), while being practical because black clothing doesn’t reveal every speck of dust you might pick up. Even if you aren’t in the mood to have too much of a structured outfit, the key is to draw attention to one statement piece that can take your outfit from drab to fab. An example is wearing a punch of color in the form of a lipstick shade, as Reese Witherspoon has been seen to do, or any other accessory. Boutique owner Laure Heriard Dubreuil travels with a scarf that flatters her skin tone. “My bright orange Hermès scarf adds a good blush tone to my complexion,” she explained to Vogue. It’s a great way to beat looking drawn after a long flight, too. A handbag is important when you’re traveling to keep all your essential documents and other vital items close at hand. Make sure it’s of a large size so that you don’t run out of space while keeping it trendy. A handbag reflecting the latest accessory trends, whether it be tassels or interesting shapes, is a must. Or take it one step further and invest in a luxe trolley whose colors or patterns match your outfit, stealing a leaf out of French actress and singer Marion Cotillard’s style bible. Stylish TV personality and fashion designer Lauren Conrad has some good packing advice: roll your clothes instead of folding them. This helps you squeeze in more into your luggage while ensuring that when you pull out that gorgeous summer dress or tee it isn’t going to be horribly creased. What is cooler than denim? It’s always in style, and with this year flaunting the denim-on-denim trend in a big way, you can’t go wrong with a case of the blues. A good tip if you want head-to-toe denim is to wear different hues of blue, such as a pale blue shirt on darker jeans, just like actress Amy Adams. You’ll look breezy! However, keep other accessories, such as your shoes and bag, in neutral tones so that they won’t make the look too busy while also working with anything you’re going to change into later, cutting your travel dress stress in half. Who doesn’t love their leggings? Not only do they go with everything but they’re a relaxed alternative to pants when you travel. Celebrities like Selena Gomez and Cameron Diaz put a twist on leggings by proving they certainly don’t have to be boring. Follow their lead by stocking up on a pair or two with interesting prints on them so that you look stylish and super comfy. When packing, you might fall into the common trap of bringing too many shoes on your trip, thinking you’re going to wear them all. You’re not alone. As fashion blogger Danielle Bernstein told the website Who What Wear, 'I always overpack shoes. You really just need a core three pairs - sneakers, sandals, and one pair of heels.' This way, you’re stylishly sorted whether you’re hitting the beach or black-tie party. Your hair is important to keep your style in perfect shape but it’s not always easy to know how to deal with flat hair after flying. That’s where dry shampoo comes in, as used by celebrities such as Blake Lively and Jessica Alba. All you do is flip your hair upside down and spritz it all over with dry shampoo, especially on your roots so that its powder consistency can soak up the scalp’s excess oil. Lots of celebs get seen at airports with layers of clothing on and this is key because of the fluctuating temperatures you’ll find when traveling. So you want to be prepared with a jacket, coat or cardi that you can sweep over your outfit while looking chic, as seen by the Olsen twins who have mastered the effortlessly stylish mantra. If you are traveling for professional reasons and want to cultivate that glamorous businesswoman allure, invest in a flattering and form-fitting coat as seen on celebrities like actress Julianne Hough. It will give you a chic yet professional appearance even if you’re wearing flats and a sleek ponytail. You can look stylish even when you’re jet-setting! Follow these tips to make your fashion sense a global affair.